Leonard Harris, known in the New York City area as an arts and theater critic for the local CBS television affiliate in the '60s and early '70s, died of pneumonia in Hartford, Conn., on Sunday. Harris was 81. Outside of New York, Harris was known for his role as Senator Charles Palantine in Martin Scorsese's Taxi Driver (1976). In the Oscar-nominated drama, Palantine is running for president on a platform of radical social change, at one point sympathizing with Travis Bickle (Robert De Niro), a mentally unbalanced taxi driver-turned-vigilante who wants to rid New York of its “scum and filth.” The eventual results aren't pretty. 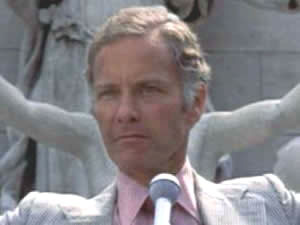 Harris played another politician, a mayor, in Martin Davidson's critically derided romantic comedy Hero at Large (1980), starring John Ritter and Anne Archer. When not making movie cameos, Harris wrote three novels, including the well-received The Masada Plan. Additionally, in the late '80s and early '90s, he served in the Tony Award Nominating Committee.